This article is about the town. For the parliamentary constituency, see Newton Abbot (UK Parliament constituency). 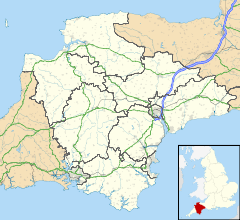 Newton Abbot is a market town and civil parish on the River Teign in the Teignbridge District of Devon, England, with a population of 25,556. Traces of Neolithic people have been found at Berry's Wood Hill Fort near Bradley Manor. This was a contour hill fort that enclosed about 11 acres (4.5 ha). Milber Down camp was built before the 1st century BC and was later briefly occupied by the Romans, whose coins have been found there. The remains of a Norman motte-and-bailey castle, known as Castle Dyke, are on Highweek Hill. A village grew up around the castle, first called Teignwick, and later Highweek – the village on the high ground. Another settlement developed on the low ground around the River Lemon and would become part of Wolborough Manor. The New Town of the Abbots (of Torre Abbey) was given the right to hold a weekly market on Wednesdays sometime between 1247 and 1251. By 1300 the two settlements were renamed as Newton Abbot (taking the low ground) and Newton Bushel (taking the high ground). On the strength of the market it quickly became a successful thriving town and a good source of income for the Abbots. Over the river on the Highweek side another weekly market was created. This one ran on Tuesdays and, because the Bushel family were the landowners this community, became known as Newton Bushel. Over the next 200 years Newton Bushel ran more annual fairs, a number of mills were set up and the leather and wool trades started. Newton Bushel was also a convenient place for travellers to stay. Torre Abbey was dissolved in 1539 and ownership of Wolborough was granted to John Gaverock who built himself a new house at Forde. The twin markets of Newton Abbot and Newton Bushel continued until they were merged in 1633 as a Wednesday weekly market under the ownership of Bradley Manor. By 1751 there was also a smaller Saturday market and three annual fairs—a cattle fair on 24 June, a cheese and onion fair in September and a cloth fair on 6 November. The markets continued to expand so in 1826 a new market was built. Over the next 50 years the buildings became dilapidated so a substantial new market was built in 1871. The buildings included a Pannier Market, a corn exchange and a public hall—the Alexandra (now a cinema). The river Lemon was also covered over. Further enlargement took place in 1938 as a new cattle market and corn exchange were built. There has been a thriving market in Newton Abbot for over 750 years. In medieval times Devon was an important sheep rearing county. Many towns had their own wool and cloth industries and Newton Abbot had woollen mills, fullers, dyers, spinners, weavers and tailors. In particular, fellmongering (where wool is removed from the sheepskin) was well established in the town. In 1724 Daniel Defoe wrote that Newton Abbot had a thriving serge industry that sent goods to Holland via Exeter. The annual cloth fair was the town's busiest fair. Over the 19th century Vicary's mills became an important employer in the town and by the 1920s they employed over 400 men. However, by 1972 business had declined and the works finally closed down. Associated with the woollen industry was the leather one. The hides left after the fellmongering process were made into leather. Tanners, boot and shoe makers, glovers and saddlers were all in business in Newton Abbot. As with the wool industry business flourished over 600 years until after the Second World War. In 1583 Humphrey Gilbert, a local adventurer, landed at St. John’s in Newfoundland and claimed the area as an English colony. The fisheries quickly developed. Between 1600 and 1850 there was a steady trade between Newton Abbot and the cod fisheries off Newfoundland. Every year men from the town would gather at the Dartmouth Inn or Newfoundland Inn in East Street in the hope of being hired for a season’s work. In the autumn the dried cod was stored in depots and sometimes used as payment. There was considerable economic spin-off from this trade. Fish hooks, knives, waterproof boots and rope were all made in the town. The Rope Walk to be found in East Street just a few yards from the Cider Bar still exists, together with the names of Newfoundland Way and St John’s Street. Just 2 miles (3.2 km) northwest of Newton Abbot lie the large ball clay workings of the Bovey Basin. The main workings are on the eastern outcrop of the deposits at Kingsteignton, which can lay claim to being the centre of Britain's ball clay industry. The Bovey Basin took millions of years to fill from rivers that flowed out of Dartmoor. The sediments included clay derived from the decomposed granite. The natural deposition has resulted in a clay that is purer and more refined than many others. Clay is used in a wide range of products such as bricks, tyres, porcelain, glossy magazines, medicines and toothpaste. Kingsteignton clay was being used to make pipes around 1680. By 1700, it was being shipped from Teignmouth, and its utilisation by the famous potter Josiah Wedgwood made it a success. The clay was extracted by simply digging out the lumps on courses—rather like peat cutting. The bulky clay was transported by packhorse to Hackney Quay at Kingsteignton, where it was loaded on to barges for shipment down the Teign Estuary, where it was transferred to small ships bound for Liverpool and other ports. Towards the end of the 18th century, the ball clay industry was steadily expanding. A local landowner, James Templer, built the Stover Canal in 1792 to help ship clay along the canal and the Teign Estuary from the Bovey Basin to the port of Teignmouth. Coal, manure and agricultural produce was also freighted along the canal. James Templer's father, also called James Templer, purchased the 80,000-acre (320 km2) Stover Estate near Newton Abbot in 1765. Granite from Hay Tor was used to build Stover House which was completed by 1792. George Templer, son of James Templer (the second) and brother of Rev. John Templer, rector of Teigngrace, built the Haytor Granite Tramway, which had rails cut from granite, connecting the granite quarries of Haytor to the canal. This was completed by 1820 and enabled large quantities of granite to be transported for major works like the new London Bridge which opened in 1825. However, George Templer overspent his resources and was forced to sell Stover House, Stover Canal, the Haytor Granite Tramway and most of the rest of the family's considerable estates to Edward St Maur, 11th Duke of Somerset, in 1829. The canal was extended to cope with this, and the industry fared well until 1858 when they were out-competed by the more economic Cornish coastal quarries. The Stover canal reverted to shipping ball clay—which only really stopped by 1939. The ball clay industry is now highly mechanised and very successful. The majority of the clay is now transported by road and transferred to ships at the nearby port of Teignmouth. The Stover Canal Society was formed following a public meeting held in February 1999. The aims of the society are to preserve and restore the canal. Railtrack who owned most of the canal transferred ownership in 2005 for the sum of £1, to Teignbridge District Council for leisure use by the community. As of 2012 work was continuing towards restoring it as an amenity. Newton Abbot railway station is situated at the east end of Queen Street. It is served by both local and long distance services. The South Devon railway reached Newton Abbot in 1846, and changed it from simply a market town with associated trades (leather and wool) into an industrial base. The South Devon Railway Company opened the station on 30 December 1846. A branch to Torquay was added on 18 December 1848, and one to Moretonhampstead on 26 June 1866, though the latter since has closed to passengers. Isambard Kingdom Brunel used the Teignmouth / Newton Abbot section to experiment with his atmospheric railway. Brunel's experiment failed, but the remains of his pumping house buildings survive at Starcross and the old Dairy Crest milk processing factory in Totnes. In 1876 the Great Western Railway bought up the railways and developed the repair and maintenance sheds into a substantial works that employed over 600 people to start with but by 1930 over 1,000 men were involved. [citation needed] Extensive sidings were also built making a large marshalling yard. The present station was rebuilt to its current form in 1927 to the designs by Chief GWR Architect P. E. Culverhouse. The large clock was gifted by the people of the town. During the late 1980’s, the number of passengers platforms was reduced from around nine down to five, only three of which see use by commuter trains to this day. The remaining platforms were greatly reduced in size on the southern side and the number of rail lines was reduced to make way for the new station car park. The South Devon Railway Engineering works was decommissioned and replaced by the Brunel Industrial Estate and of the two buildings that survived into the 21st Century, only one remains intact, as the old sheds burned down on the 21/10/2018; an avent that was visible from up to twelve miles away. Many other industries were set up beside the railway station, including a timber yard, iron and brass foundries, and engineering works. The Newton Abbot power station was also built adjacent to the line on the Moretonhampstead branch. The town’s population increased from 1,623 in 1801 to 12,518 by 1901. Terraced streets were built to house the workers and attractively styled villas sprang up around the town for the wealthier professionals and retired people. Two Royal Navy personnel from Newton Abbot were among the first British casualties in World War I, being killed after their ship was torpedoed by a German U-Boat. Over the course of WWI and WWII, more than 250 Newtonian men sacrificed their lives for the British Empire, being immortalised in the town’s war memorial, and a further eleven Commonwealth soldiers are buried in the town. The town was bombed twice in air raids during World War II, killing a total of 21. There was a severe flood on 27 December 1979, the latest in a long series, when the River Lemon burst its banks after prolonged rain. Tucked into a corner of the racecourse, Newton Abbot's stock car track flourished for nearly 30 years, and attracted fans and drivers from all over the South of England. A short 300-metre oval track, it featured races for the cars of the BriSCA organization, as well as saloons and "bangers". A new hospital to replace the one in East Street was built at the end of Jetty Marsh Road, and opened on 12 January 2009. Newton Abbot is the main town in the Newton Abbot parliamentary constituency. The constituency was created in 2010 when it was won by Conservative Anne Marie Morris. Newton Abbot has two seats on Devon County Council. These are Newton Abbot North and Newton Abbot South. In the 2013 County Council elections, Newton Abbot North was won by Eve Barisic (Conservative) having previously been won by the Liberal Democrats in 2009 and Newton Abbot South was retained by sitting Councillor Gordon Hook  (Liberal Democrats). The town is represented by 9 district Councillors on Teignbridge District Council and has a Town Council. Coombeshead Academy is a comprehensive school, located on Coombeshead Road. The school is a trust school and a specialist media and arts college. The school educates around 1,442 pupils, aged 11 to 18. Newton Abbot College is a comprehensive school, located on Old Exeter Road, that was established on 1 September 2008 by the renaming of Knowles Hill School. The school, a specialist Technology College, educates around 1,200 pupils, aged 11 to 18. South Devon UTC is a university technical college located on Kingsteignton Road. It was established on 1 September 2015 and educates pupils aged between 14 and 19. Primary schools include St Joseph's Roman Catholic Primary School, Decoy Primary School which has been awarded the Becta ICT Mark, Eco and Healthy School awards,[citation needed] as well as Bearnes Primary School, Canada Hill Primary School, Wolborough C Of E Primary School, Bishop Dunstan School, Bradley Barton Primary School, Haytor View Primary School. The first declaration of William III, Prince of Orange, the glorious defender of the Protestant religion and the liberties of England, was read on this pedestal by the Rev. John Reynell, rector of this parish, 5th November, 1688. Although William arrived in Brixham on 5 November he did not reach Newton Abbot until 6 November when he stayed overnight in the town at Forde House as he made his way to London to assume the English throne. The tower can regularly be seen flying the Union Flag or the Flag of Newton Abbot (The Flag of Devon defaced by the silhouette of the tower). Forde House (now known as Old Forde House) is situated in the southeast corner of the town, in the parish of Wolborough. The present house was built in 1610 by Richard Reynell (who later became Sir Richard Reynell) and his wife Lucy. The house was built with an E-shaped floor plan, which is thought to be in honour of Queen Elizabeth I, who had recently died. The grounds were originally quite extensive, including the whole of what is called Decoy (so named, because wildfowl were decoyed there to extend the house's larder), as well as a deer park (known locally as Buckland) which is now home to a housing estate as well as the iBounce trampoline park. In 1625 King Charles I stayed at the house overnight on his way to inspect the fleet at Plymouth. He returned a few days later and stayed for a further two nights. Forde House gave shelter to Oliver Cromwell and Colonel Fairfax while on their way to besiege Royalist Dartmouth in 1646. In 1648 the estate passed onto the Courtenay family via the marriage of Margaret (the only daughter of Jane Reynell and Sir William Waller) to Sir William Courtenay, who was the lord of nearby Powderham Castle. William of Orange stayed at the house in 1688 on the way to his coronation in London, having landed in Brixham a few days earlier. The house remained the main residence of a succession of Courtenays until 1762 when the house was let to a succession of occupiers. The Courtenay family sold the house in 1936 to Mr Stephen Simpson, who sold it two years later to Mrs M Sellick. Teignbridge District Council bought the house in 1978 and remain the current owners. It has been refurbished by the Council and is now used as office and conference space as well as being used for weddings and other events. At the opposite end of Newton Abbot is the National Trust property, Bradley Manor. This is a 15th-century (circa 1420) manor house in its own secluded woodland setting, with a notable great hall emblazoned with the royal coat of arms of Elizabeth I. Nearby is Bakers park. The Great Western Railway named a 7800 class steam locomotive after the manor, however the locomotive was never based in Newton Abbot (Shed Code: 83A) and was withdrawn from mainline service in the 1965. The locomotive was restored in the 1980s and passed through Newton Abbot on special excursions, namely The Torbay Express and The Mayflower. John Passmore Edwards originally wanted to have a hospital built for the town in memory of his mother, who was born there. However, as the town already had a hospital, he decided on a public library, which was opened in 1904. The building is one of the most impressive in Newton Abbot, and originally housed both the library and a Science, Art and Technical School (which the Council wanted to include). The building was designed by the Cornish architect Silvanus Trevail. The style is elaborate Renaissance, and much use is made of yellow terracotta mouldings over the windows and doorways. Passmore Edwards donated £2,500, while the County Council and a public subscription paid for the rest of the building. The building was renovated in 2010–2012. On re-opening it was renamed the Passmore Edwards Centre in honour of its benefactor and to reflect its future as a multi-purpose facility. The Library now works closely with Coombeshead Academy. There are several sets of almshouses in Newton Abbot. Gilberd's in Exeter Road were endowed in 1538 by John Gilberd of Compton Castle to house lepers. There were five houses and they reputedly had sloping floors to help in washing out the houses. Eight modern apartments with a common room and visitors bedroom now occupy the site, which is administered by the Feoffees of Highweek. In 1576 Robert Hayman set up a number of houses for poor people in East Street. These were rebuilt in 1840. Reynell's almshouses were originally built in 1640 beside Torquay Road to house four clergy widows ("the relicts of preaching ministers, left poor, without a house of their own") These were rebuilt in 1845. Mackrell's almshouses in Wolborough Street were built in 1874 by J. W. Rowell. Mackrell was a native of Newton Abbot who made his fortune as a chemist in Barnstaple. Mackrell also funded a home in the Forde Park area for the "fallen women of Newton Abbot", which housed single mothers fallen on hard times. The original Newton Abbot poorhouse was based in East Street, and the cellar of the Devon Arms was used as the oakum picking room—where paupers were assigned the unpleasant job of untwisting old rope to provide oakum, used to seal the seams of wooden boats. Newton Bushel had its own poorhouse, not far from present day Newton Abbot Leisure Centre, previously known as Dyron's. The 1834 Poor Law Act required changes and incorporation, so in 1839, a new workhouse was built in East Street and was used to house paupers from the surrounding areas. Over time, the workhouse became more of a hospital for the sick, infirm and aged poor. By 1890 there were nearly 400 inmates, and reports of cruel treatment. A new infirmary was built, and during the wars some of the buildings were used as a military hospital. By 1950, the workhouse buildings were incorporated into the hospital in East Street. The entire site has now been redeveloped. Close to the railway station is Tucker's Maltings, the only traditional malthouse in the UK open to the public. The malthouse—which offers the visitor hour-long guided tours, from the barley to beer discovery centre—produces malt for over 30 breweries, and enough to brew 15 million pints of beer per annum. In April every year, the maltings hosts a three-day beer festival where over 200 different real ales can be sampled. Said to be one of only two remaining cider houses in the United Kingdom, Ye Olde Cider Bar in East Street sells only cider, perry, country wines and soft drinks. Its interior and the simple wooden furniture have remained relatively unchanged for over thirty years. However some of the old customs associated with the bar such as limiting women and holiday makers to half pint measures and covering the floor with sawdust have now gone. After it’s 2019 relocation, the museum will be located in the “Newton’s Place” community centre on Newfoundland Way. The museum will detail the history of Newton Abbot and of the Great Western Railway. In 1922 the Newton Abbot Urban District Council instructed its Borough Surveyor, Coleridge Dingley White, to design a town memorial that reflected the importance of the town and the great contribution its young men had made to the war effort  The Unveiling and Dedication of the War Memorial was on Sunday 23 July 1922 at 3pm . Newton Abbot has two non-league football clubs: Buckland Athletic F.C. who play at Homers Heath, and Newton Abbot Spurs A.F.C. who play at the Recreation Ground. The headquarters of Devon County Football Association is in the town. Newton Abbot's cricket club, South Devon C. C., was established in 1851 and also play at the Recreation Ground. The town also has a long-standing rugby union club, Newton Abbot RFC (established 1873), who play home games at Rackerhayes in nearby Kingsteignton. John Angel, sculptor, born here in 1881. He designed the Exeter War Memorial, emigrated to America where he did much ecclesiastical carving. Sir Samuel White Baker, explorer, big-game hunter, writer and abolitionist, bought the Sandford Orleigh estate in 1874, and died there in 1893; Baker's Park in the south west of the town is named after him. ^ "City Population". Retrieved 27 June 2015. ^ "Newton Abbot Racecourse". horse-racing.co.uk. Retrieved 26 June 2015. ^ a b c d Hoskins (1954) p.442. ^ "Home page". Stover Canal Society. Retrieved 1 June 2012. ^ "Newton Abbot North division". Devon County Council. Archived from the original on 4 June 2013. ^ "Newton Abbot South division". Devon County Council. Archived from the original on 4 June 2013. ^ "Cllr Eve Barisic". Devon County Council. Archived from the original on 4 June 2013. ^ "Newton Abbot North Election Result 2013". Devon County Council. ^ "2009 Devon County Council Election Results (pdf)". Devon County Council. Archived from the original on 29 April 2011. Retrieved 10 May 2013. ^ "Cllr Gordon Hook". Devon County Council. ^ "Newton Abbot Town Council". ^ "Newton Abbot new community library". Archived from the original on 6 September 2012. Retrieved 18 October 2012. ^ a b c Cherry (1989) p.593. ^ "Newton Abbot War Memorials". www.devonheritage.org. Retrieved 2018-12-11. ^ "The War Memorial | Exhibitions | Newton Abbot Town & GWR Museum". www.museum-newtonabbot.org.uk. Retrieved 2018-12-11. ^ "John Angel". Mapping the Practice and Profession of Sculpture in Britain and Ireland 1851-1951. University of Glasgow History of Art and HATII, online database. 2011. Retrieved 18 December 2016. ^ Unsworth, Harry (1993). A New Look at Old Newton Abbot. Coffinswell, Devon: Mike Bateson Publishing. p. 79. ISBN 0-9521689-0-1. ^ "Frank Crocker". WikiTree. Retrieved 23 April 2014. Beavis, Derek (1985). Newton Abbot, The Story of the Town's Past. Buckingham: Barracuda Books. ISBN 0-86023-236-0. Cherry, Bridget; Pevsner, Nikolaus (1989). The Buildings of England: Devon (second ed.). Penguin Books. pp. 584–595. ISBN 0-14-071050-7. Hoskins, W. G. (1954). A New Survey of England - Devon. London: Collins. pp. 441–443. Jones, Roger (1986). A Book of Newton Abbot. Bradford on Avon, Wiltshire: Ex Libris Press. ISBN 0-948578-06-8. O'Hagan, Mary (1990). A History of Forde House. Frome, Somerset: Butler & Tanner Ltd.